The force wore the helmets on their 513th anniversary. To celebrate their 513th anniversary, the Swiss Guard -- the tiny security force that protects the Vatican –- has debuted modern 3D-printed helmets made of a strong but light-weight plastic. The new helmets, worn for the first time on Tuesday, are a mixture of practicality and function. The cast-iron helmets the guards have traditionally worn, which were forged as part of their ceremonial armor, are heavy and allegedly prone to denting. They are also exceedingly uncomfortable during Rome’s sweltering summer heat. The new helmets, made of thermoplastic, weigh just over one pound and are fitted with air vents. Often called the world’s smallest army, the Pontifical Swiss Guard is responsible for the safety of the Pope and the security of the Apostolic Palace, the complex within Vatican City that is the traditional home of the pontiff. The guards’ brightly-colored uniforms, swords, medieval-style armor and red-feathered helmets are all part of a tradition dating back to the 16th century. (Vatican Media via Shutterstock) The Pontifical Swiss Guards new helmets made of thermoplastic and made with a 3D printer from a scan of the original metal helmets, Jan. 22, 2019, at the Vatican. To produce the new helmet, the 16th century original was scanned, it’s digital data reworked on a computer, and a new helmet printed in plastic, according to Swiss media outlet SWI. The entire production process takes approximately one day, according to SWI -- a fraction of the time needed to hand-forge the original metal version. 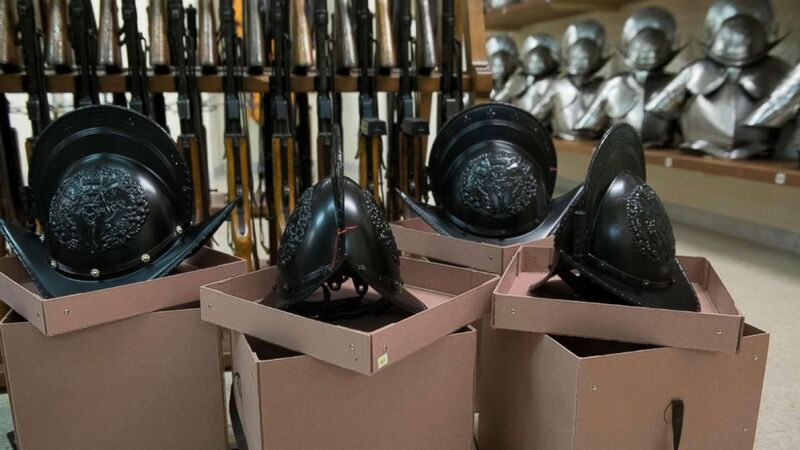 During a press conference last May when the new helmet initiative was announced, Swiss Guard Commander Christoph Graf said the helmets had been purchased through an informal crowdfunding campaign, according to Crux, a catholic-focused news website. The helmets cost a fraction of the price of the older ones -- roughly $1,000. This initial roll-out was limited to 98 helmets, with 120 more expected later this year, according to SWI.